The funeral prayer was offered at Khak, Medical Complex Ground, offering Begum Kulsoom Nawaz in the face of Mian Sharif, Chairman Senate, Speaker National Assembly, Governor Punjab, Chaudhary Brothers, Khursheed Shah and other leaders attended the meeting. According to details, funeral prayers of Maulana Tariq Jamil have been played in Beginning of Begum Kulsoom Nawaz’s funeral prayers. 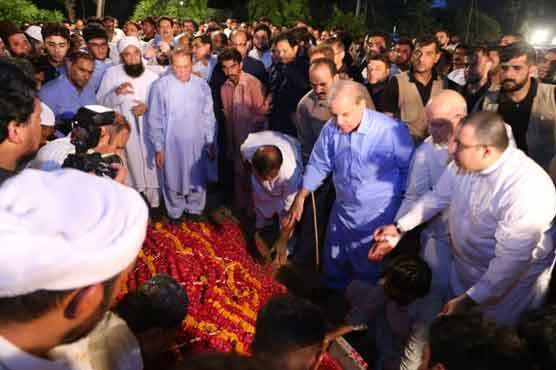 In the funeral prayers of the deceased in Sharif Medical City, foreign personalities, key political leaders and large number of Muslim League workers attended. In the funeral prayers of Begum Kulsoom Nawaz, both Nawaz Sharif’s son Hassan Nawaz and Hussain Nawaz NAB refer to Pakistan did not come to Pakistan. In the funeral prayers, Tehreek-e-Insaf, PPP, Muslim League (Q), besides the leaders of MQM Pakistan and Jamaat-e-Islami in addition to political leaders and other important personalities, people belonging to other fields were also involved in a large number of people. The security arrangements were made to avoid any unfortunate incident on this occasion. Begum Kulsoom Nawaz’s dead body was brought to London from Lahore via PIA flight PK-758 on Friday morning, there were 14 people in the family including Shahbaz Sharif, Asma Nawaz, Son in law Usman Dar and Husain Nawaz, along with two sons. Former Hamza Shahbaz, Salman Shahbaz and Javed Safdar received the death of Begum Kulsoom Nawaz on Lahore Airport. After which dead body was shifted to Sharif Medical City Jati Umra in a tough security zone. Last month, funeral prayers have been taken in the former female Begum Kulsoom Nawaz’s Islamic Culture Center Regent Park Mosque London. In addition to Shahbaz Sharif, Hassan Nawaz, Hussain Nawaz, Chaudhry Nisar and Ishaq Dar The number of Pakistanis in Britain also participated; Funeral prayers Imam Shaikh Khalifa honored me. It is clear that Begum Kulsoom Nawaz had suffered cancer infections since last year and he was under treatment in London. He died on September 11, while the Punjab government released Nawaz Sharif, Mary Nawaz and Captain Retired Safdar on September 17.